Roasted vegetables are super easy to make as the method is almost always the same. Cut vegetables, rub oil and salt over them and place in oven. I try to minimize the use of roasted vegetables because this method of cooking can be very drying to the body but it sure tastes good! 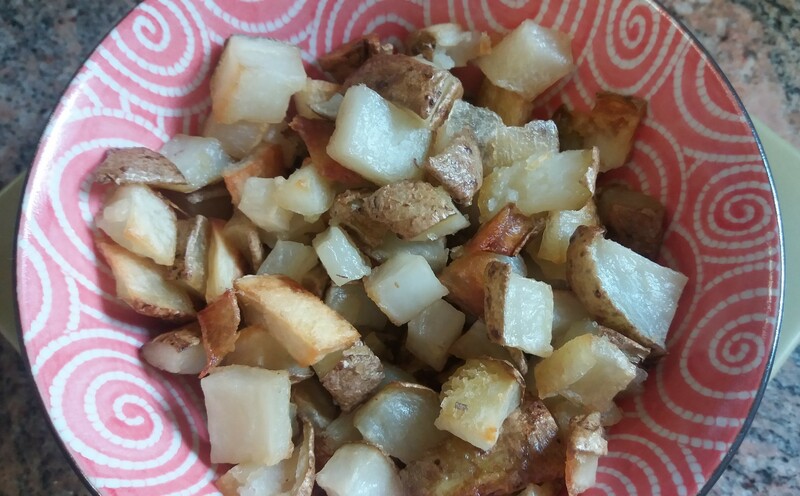 Place the diced potatoes in a baking dish. Pour enough olive oil over the potatoes such that you will have enough to coat every piece with oil (it is less oil than you might think). With your hands, massage the oil over all the potatoes. Add a pinch of salt and continue to massage the salt and oil over the potatoes so that it feels like all the pieces are oiled with a little salt. Add salt as needed. Place dish of potatoes in oven and roast for 40 minutes or until done. optional modification: To spice things up a bit, mix 1 teaspoon each of dried oregano, thyme and garlic powder together. Rub this mixture into the potatoes with your hands at the same time as the salt.